I’ll admit it: I’m a sucker for traditional food markets. I seek out farmers’ markets in the U.S. and traditional food markets when I’m abroad. Belize, Mexico, Peru, Ecuador… I’ve explored markets in all these countries, thrilled at the colors, the smells, and the variety of wares, many of them exotic local fruits, vegetables, and more. 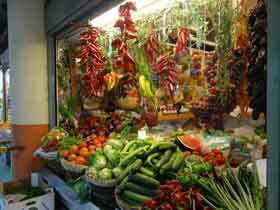 And, of course, I’ve explored many markets in Spain. It was in Spain, in fact, that I first came to appreciate the joys of wandering a local market. Spain has many wonderful markets, but these (for now) are my three favorites. 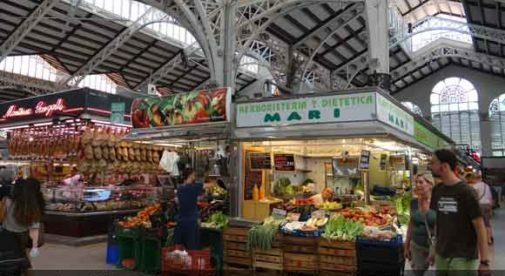 The Mercado de La Ribera, right by the estuary in Bilbao’s old city, is billed as the largest food market in Europe. It’s definitely large, with several floors of greengrocers’ stalls, fishmongers, butchers, and stalls selling goods like olives, pickled eggplant and onions, nuts of every kind, and local cheeses with tongue-twisting names like idiazábal (I’ve tried this one—it’s great). Sausages both cured and fresh dangle from the ceiling, alongside fat cured hams. Basque food is justly famous in Spain, and it’s all on show here. The market is conveniently near tramway and metro stops, and just across the street from cafés where you can get breakfast. The province of Valencia is one of the gardens of Spain, so it’s fitting that the capital city has a superb market. Housed in a soaring wrought-iron-and-glass building in Valencia’s large historic center, it’s home to a wealth of stalls offering just about anything you might want. I personally home in on the stalls selling frutos secos—which literally means “dried fruits,” including prunes, apricots, and figs, but encompasses a whole range of nuts, as well, such as chestnuts and hazelnuts. Fat Marcona almonds, a gourmet item in the U.S., are a local specialty here, toasted and salted to perfection. They cost half as much—about $6 a pound—and taste twice as good as in the U.S.—assuming you can even find them back home. I always stock up. Elsewhere in this massive market, you can also buy cooked and raw meats, like salami and sausage, cheeses, baked goods, seafood, herbs and spices, and more. Prices can be surprisingly low in Alicante’s large market. This beach-resort city on the Mediterranean may be known as a tourist mecca, but it’s also home to over 300,000 ordinary Spaniards. And many of them shop in the market, a solid two-story building right in downtown Alicante, on a busy commercial street just a few blocks inland. Buy your meat and fish on the upper level, then head downstairs for the riot of color in the fruit and vegetable stalls. Prices can be surprisingly low. I bought Marcona almonds here, too, on a visit last year. But my favorite purchase was deliciously ripe black figs—half a pound for about $1. Sadly, I left them in my hotel refrigerator by mistake when I left Alicante, and I mourned their loss for days. Of course, I have plenty of runners-up to this three-market list. Granada’s market is excellent, for instance, and rich in local products like pimentón, Spain’s smoky paprika, and locally cured olives. I can’t bring the olives through customs…but a few tins of pimentón are always in my luggage to the U.S. There may be several markets in Barcelona; I know only the lovely one in the bohemian Barceloneta neighborhood, which is where I’d shop if I lived there. Madrid, in an effort to entice locals back to traditional markets, has gone upscale with several of its markets, notably the Mercado de San Miguel, in the old city. I doubt I’d do my daily shopping here—it’s a bit high end for my humble veggies—but I’d definitely come to buy gourmet items and then have a tapa or two with a glass of fine wine at one of its many chic bars. For visual appeal and “ooooh” factor, I give a big thumbs-up to San Miguel and other upscale markets like San Antón, also in the old city. And there are still plenty of wonderful cities whose markets I’ve never visited…including what friends tell me is the absolute best of all: the majestic market in Santiago de Compostela, in Spain’s northwest region of Galicia. Like many regions of the north, Galicia is known for its great food. The green, wet climate—remarkably like Ireland—produces lovely white wines, delicate fruits and vegetables, superb seafood, and other goodies. In my personal experience, it’s virtually impossible to have a bad meal in Galicia. And Santiago—a pilgrimage destination for more than a thousand years—is always worth another visit. So I’ve added its market to my “to-do” list. Stay tuned. Learn more about Spain and other countries in our daily postcard e-letter. Simply enter your email address below and we’ll send you a FREE REPORT — Live the Good Life in Sunny, Affordable Spain.